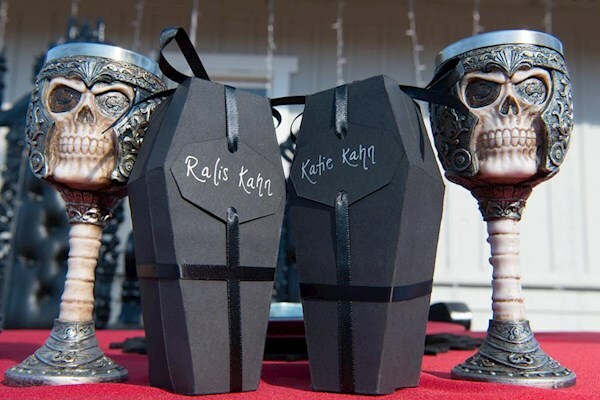 They say the Devil's in the details, well that was certainly the case for Katie and Ralis who planned out and executed their Satanic wedding back in October. Katie was kind enough to talk us through how they put together this unholy matrimony! Can you please introduce yourselves, tell us where you're from and where and when you got married? We are both in the Los Angeles film industry. Ralis is a special effects makeup artist. I would say he specializes in blood rigging and zombie makeups! 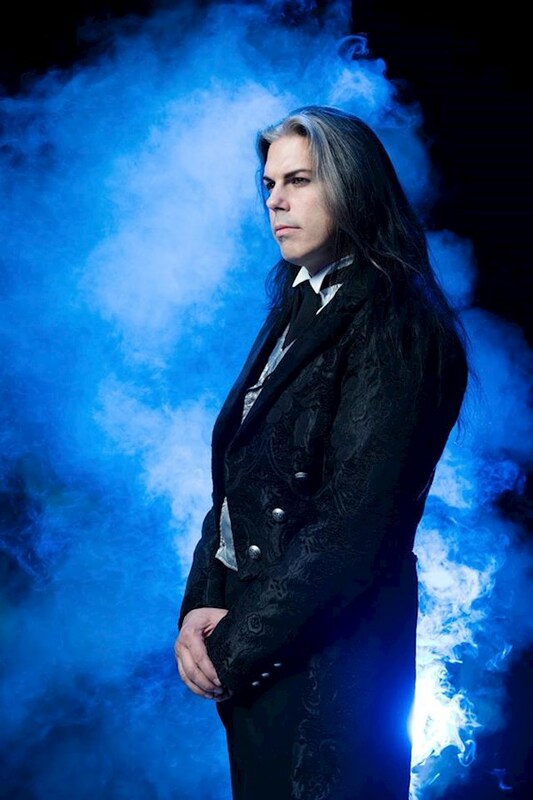 He was Marilyn Manson’s makeup artist for many years, as well as Slipknot’s mask fabricator. I am a seamstress. 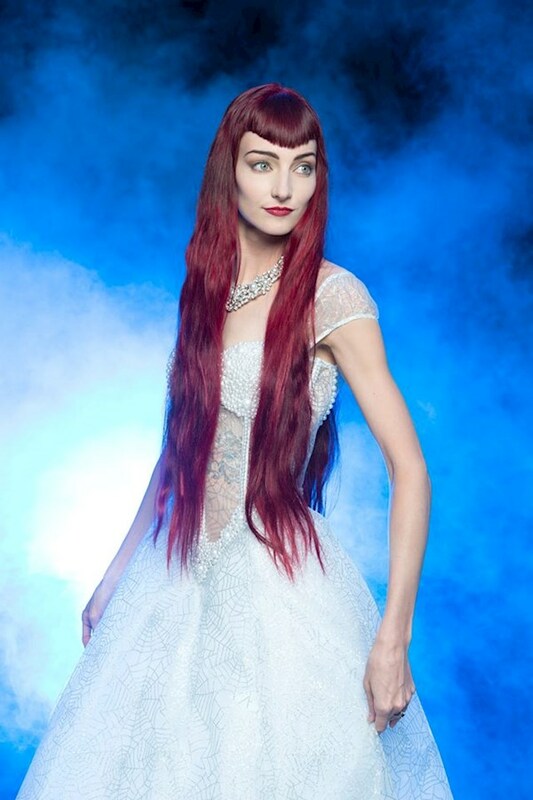 I make custom costumes and alter garments for costume designers, as well as manufacture my own designs under the label Insidious Clothing. Together we own a Halloween mask company called Mad Monster Masks. We make two-piece masks that move with your jaw so you can eat, drink, scream, and breathe while wearing the mask. We moved out of Los Angeles a few years ago so we could grow our business, and we ended up in Yucca Valley (near Joshua Tree National Park). We had our wedding on October 8, 2016, at our half-acre property in the desert. We did a very DIY wedding, almost everything was custom-made! Because I love to sew, I knew I would make my dress (and that it had to be made of spider web fabric). But I wanted Ralis to have something to show off for the ceremony too, so I asked him to slit my throat. 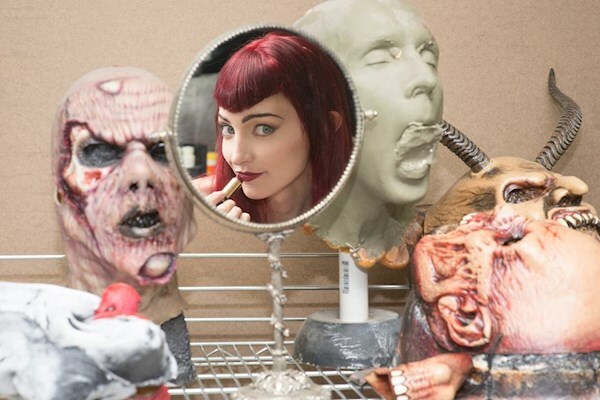 He made a mold of my throat, sculpted a larger version of my throat, ran it in silicon, and did one test application with the tubing to make sure it would all work. The most common stage blood is made of corn syrup and is very sticky. When I was first imagining the ceremony I considered making two dresses, so I would have a “stunt” dress for the blood, then change into the clean one after. I realized right away that my dress was too much work to do it twice! So Ralis made a different blood formula with watered down red fabric paint and some acrylic paint to tint it darker. This way the blood would dry and be permanent on the dress. He actually has a few dozen blood recipes for different applications! We made pretty much everything! I wanted the pentagram once I decided to have the wedding party in cloaks - Ralis made it out of red LED tubing, PVC pipe, and another more flexible tubing that’s used for pool plumbing. It was attached onto some scaffolding to raise it off the ground! The Necronomicon guest book was also 100% from scratch - Ralis sculpted the cover, and I tea-stained heavy sheets of paper and hand-bound them into a cover made from chipboard and fabric. Together we glued the squishy silicon face onto the book cover. 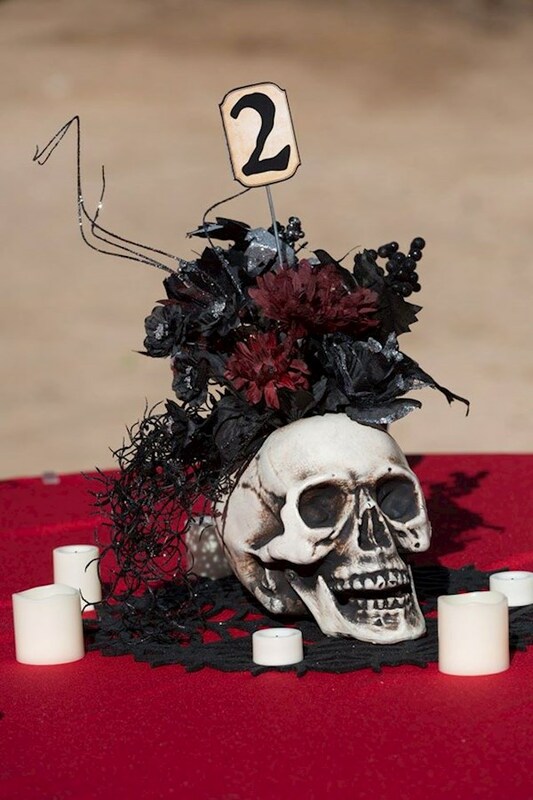 The center pieces were just Halloween prop skulls from Home Depot. Ralis repainted them, my dad drilled holes in the head, and my mom and I did the flower arrangements with sand in the bottom to keep them sturdy. 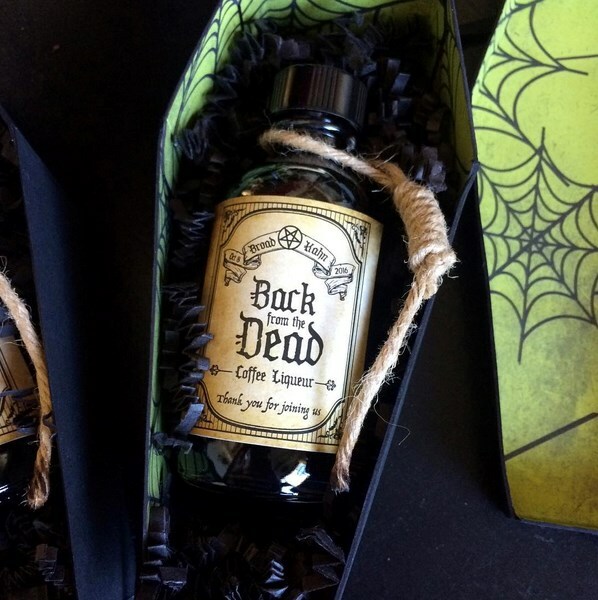 For the guest favors / table placecards, I made coffin boxes from black cardstock and assorted Halloween scrapbook paper, bought glass bottles that we filled with coffee liqueur, and my mom designed the stickers on the bottles. They needed a little something more so I got some twine and made the little nooses for each one! The shot of me putting on lipstick in the mirror is from our work shop / garage. Those are Ralis’ old band prosthetics (Dead By Day) and some of our Halloween masks that we make. We actually did have traditional vows! 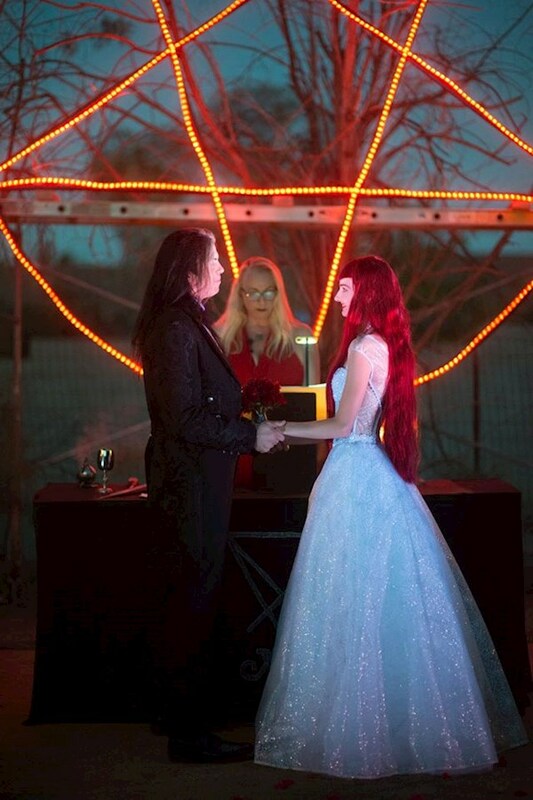 Just not traditional in the way most people would think… It was a traditional Satanic wedding, officiated by the Church of Satan. This was the most important thing for Ralis - I got to make all of the decorating decisions, and he was in charge of the ceremony and the food decisions. 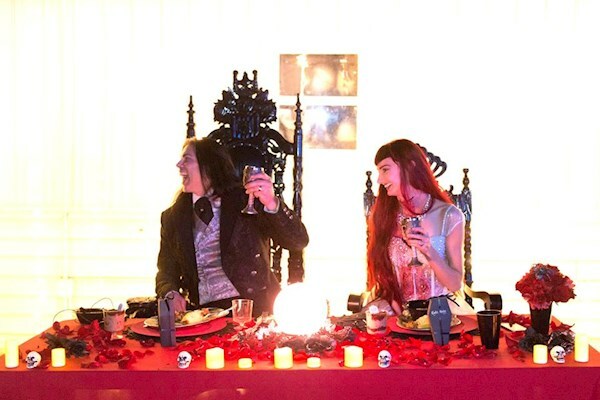 We didn’t have a naked woman for the altar though, and we added the blood at the end, which is not endorsed by the Church of Satan and was almost a reason for them to turn us down! Of course there were a lot of “Hail Satan!”’s throughout and I was surprised how many of our guests got into it by the end! Our Officiant, Ruth Waytz, was just amazing and so much fun! I desire to live with you just as you are. I choose you above all others, to share my life with me. 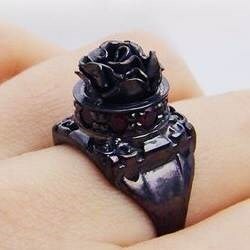 I promise to always speak the truth to you, to honor and to tenderly care for you. I love you for yourself, in trust that you will become all that you can be, and in turn I promise to be as great as my Nature and Will allow. I will honor this pledge as long as life and love endure. 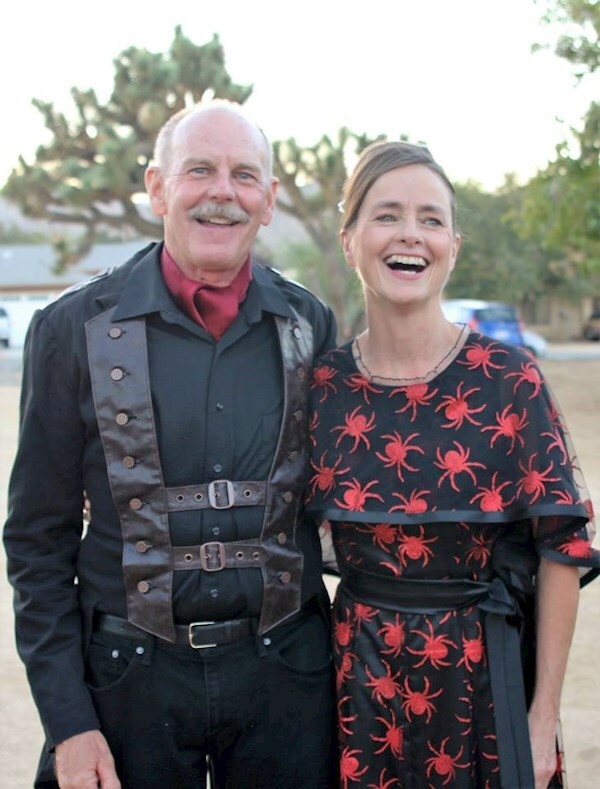 I made my dress (as well as my mom’s spider dress and the wedding party cloaks). I was incredibly lucky to find the silver spiderweb print on white organza, and the company that I bought it from has since closed down. The pearls were glued on by hand. I lost count of how many layers of tulle are in the skirt. I wanted to add more but it was getting difficult to fit through doorways haha! The pearl necklace I got on eBay because we needed something to hide the seam of the neck appliance. Ralis wore an outfit from Historical Emporium, which made it really easy because it was already styled perfectly. His tailcoat is by Shrine. To save a little money we got his shirt on Amazon. Who made that fantastic cake? I did! We were going to hire an expensive cake maker but they never got back to me, so we decided to save the money and make something more special. I used the template from Haunted Dimensions of the Phantom Manor house, and some advice from other websites about making the butterscotch cut-out windows. The best piece of advice was to decorate the walls before assembling the house. It took a week to make because there was so much drying time, I could only do a small portion of the house at a time. 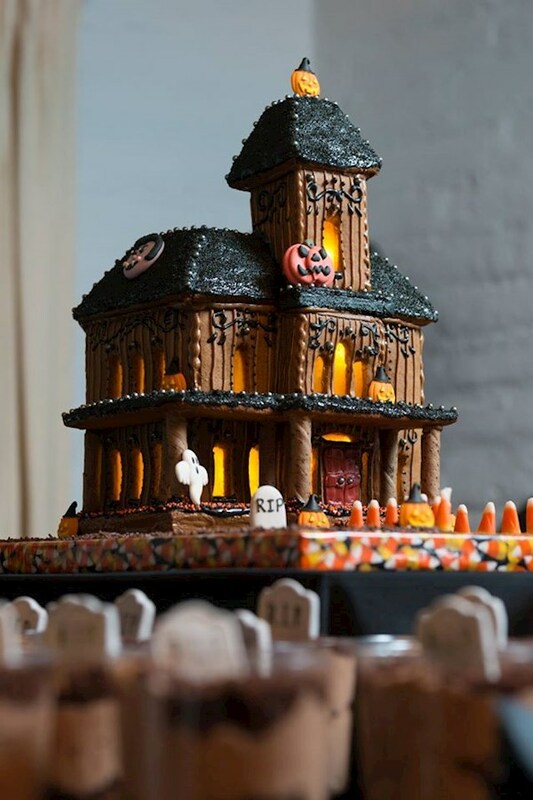 Were your guests all happy with the theme? Yes! Although we made it easy on ourselves and only invited friends and family that we knew would enjoy themselves. 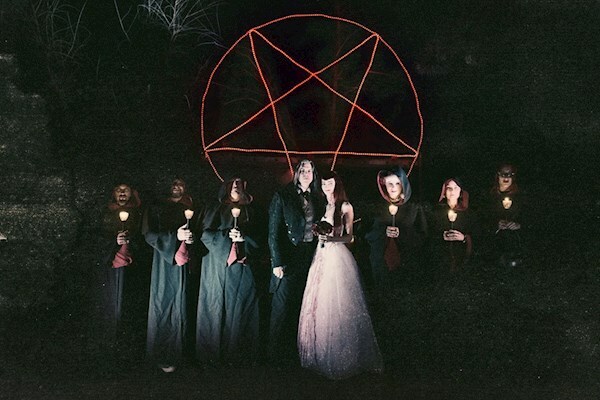 And we warned everyone on the Save The Dates that it was going to be a Satanic wedding, so if anyone was uncomfortable they could decline early. Some of your photos look like movie stills! Do you feel you achieved the mood you were going for? Our photographer, Alex Solca, was amazing! He did a fantastic job with the photos, and our guests all really liked him too! We met in person to talk about the wedding, and I sent him some inspiration photos of black metal album artwork and noir movie/fashion shots. In addition to weddings, Alex also shoots metal bands so he knew exactly what to do. He brought lights and a fog machine and back drop and really nailed the fantasy shots before the ceremony. And the shots during and after the ceremony are just so cool! We had over a year to plan it, but it was horrifying how quickly the time went by! I started making lists and calendars early on to stay on schedule, but as the day was approaching there were so many little details that got put off and were adding up quickly. My parents stayed with us for a month prior to the wedding and were a huge help tackling everything. I was the most stressed over the ceremony. 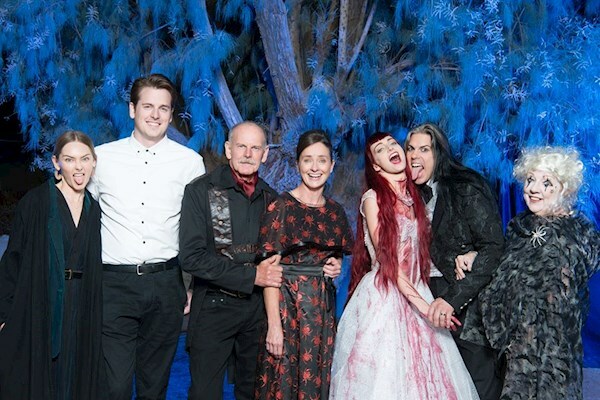 When Ralis was determined to have a Satanic wedding, I was worried it would be too serious and too religious. We aren’t serious people, we’re constantly laughing and goofing around, and we aren’t religious at all. After talking with our Officiant for the first time, my nerves were calmed because she was just like us - a little ball of sunshine with a love for the macabre! Ralis was the most stressed about the blood rig and timing the makeup application. There’s a lot that can go wrong, and you only get one shot. Usually he would use compressed air from a fire extinguisher or an air compressor, but it wouldn’t have worked for this. So he ended up using a large syringe covered in fake red hair, safety pinned to the back of my dress! We were also racing against time because of the lighting - we started the ceremony just as the sun set, and by the end we were in pitch black. It was all perfect! I would have invited more people. I didn’t think we would have such a positive reaction! I thought people wouldn’t want to travel so far just for a wedding, or that the Satanism aspect might hurt our relationships, but I didn’t realize how special it would end up being, and that people can look past things that they don’t agree with (we have all been to Christian weddings after all!). Also I wish we had taken a sledge hammer to the gingerbread house! It was too hard to break apart to eat, and it would have been a good 'cutting the cake' photo. When my dad walked me down the aisle! That was something I added into the ceremony. We walked to the title track of The Omen (Ave Satani), and Ruth, our Officiant, was saying the Infernal Names. I thought I would be too nervous in front of everyone, but I was so happy and lucky to have such an open-minded family, it was just an amazing, beautiful feeling! Do you have any advice for couples who are currently planning an alternative wedding? Definitely use The Knot for general information, timelines, and reminders. There is a lot of good advice that you can tweak to your freak. Your ideas will evolve as you go along so don’t be stubborn with your original plan - I planned on not having any flowers but we ended up with fake flowers at each table and a real flower bouquet. I also changed the fabric of my dress after two fittings because the first one wasn’t quite right. Don’t be afraid to really do your own thing! It makes your wedding more special and people will appreciate something fun and unusual! No one wants to go to a boring wedding. I have had so many strangers see our wedding photos and remark that it’s the only wedding they have ever wished they attended! Thanks for sharing your incredible day with us! Thanks also to Alex Solca for his killer photos, you can find his website right here.